Trastevere, which means "Across the Tiber," was one of Rome's great medieval working-class neighborhoods, one that spoke its own distinct dialect and had a tradition of street fairs and poetry—still echoed in the July Festa de' Noantri, or "Feast of We Others." But after Trastevere became trendy in the 1970 and 80s—popular both with the Roman upper middle class and lots of ex-pat Americans (yeah, yeah, so I'm guilty; I used to live here, too)—it became touristy in the 1990s. It always had lots of restaurants and excellent tiny trattorie, but this boom in popularity has filled it beyond bursting with eateries, pubs, dance halls, funky boutiques, sidewalk vendors and fortune tellers, and a constant, stifling crush of trendoids and tourists. It's still as picturesque as any corner of Rome comes: a warren of narrow, cobblestone-paved streets and alleys that twist and turn and suddenly spill into pocket-sized piazze filled with market stalls or anchored by a medieval church, laundry hanging from marble windowsills set in ochre or gold or pale rose plastered walls, and tiny shops, boutiques, and trattorie pigeonholed into the ground floors of every building. However, you should know that Trastevere has also become a requisite stop for coach tours and a guided walk in travel books. It's still one of Rome's most colorful quarters, and the best place to come if you just want to wander into a good restaurant at random, but, like the Latin Quarter in Paris or SoHo in New York, it has degraded a bit into a parody of itself. Doesn't mean I don't come here for dinner one night in three whenever I'm in Rome! 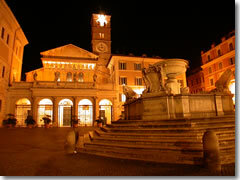 How long does Trastevere take? 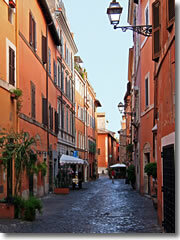 Planning your day: Trastevere makes for a perfect afternoon. 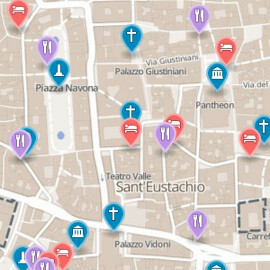 Head over here after lunch to tour its churches and sights, then stick around for dinner, followed by the famous nightlife in Trastevere and, perhaps, a climb up Gianicolo Hill when you're done.